Days of Our Lives Spoilers: Leo’s Smitten With Xander – Just The Break WilSon Need to Get Rid of The Pest? Days of Our Lives (DOOL) spoilers tease that Leo Stark (Greg Rikaart) will soon get a major shocker. Leo’s been causing all sorts of problems for Sonny Kiriakis (Freddie Smith) since he blackmailed Sonny into marrying him. He’s been embarrassing Sonny in public and threatening to go public with how Sonny “killed” him and covered up the crime unless Sonny stays away from Will Horton (Chandler Massey). But soon Leo will get a major distraction from Sonny. He’ll lay eyes on Xander Kiriakis (Paul Telfer), who will soon be back in Salem. Days spoilers say that Leo will take one look at Xander and be immediately smitten by him. Xander enjoys running around shirtless, so perhaps Leo will catch a glimpse of that. Of course, if Sonny’s smart, then he’ll use Leo’s infatuation with Xander to his advantage. It would be good for Sonny if he could somehow enlist Xander’s help in keeping Leo distracted while he spends time with Will. 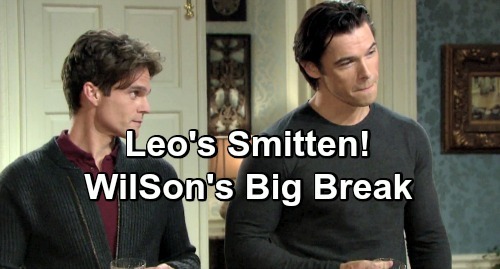 Or, since Xander’s pretty devious, perhaps he could help Sonny come up with a plot to get rid of Leo. But all of this would necessarily mean that Xander would have to cooperate with Sonny and actually be motivated to assist him. Unfortunately, Xander’s not much of a team player unless there’s something in it for him. Plus, Xander doesn’t particularly like Sonny, it’s doubtful that Xander will cooperate. Still, Leo’s fixation on Xander could help Sonny. It’s amusing to think of Leo following Xander around the Kiriakis mansion like a puppy. Xander may not take kindly to all the unwanted attention from Leo, and this might make for some interesting interactions between the two. It may also free up Sonny to sneak out and go see Will on occasion. Are you looking forward to seeing Leo and Xander share the screen? Stay tuned to DOOL and don’t forget to check CDL often for the latest Days of Our Lives spoilers, updates, and news.